OpenSimulator is an open source multi-platform, multi-user 3D application server. It can be used to create a virtual environment (or world) which can be accessed through a variety of clients, on multiple protocols. OpenSimulator allows virtual world developers to customize their worlds using the technologies they feel work best - we've designed the framework to be easily extensible. OpenSimulator is written in C#, running both on Windows over the .NET Framework and on Unix-like machines over the Mono framework. The source code is released under a BSD License, a commercially friendly license to embed OpenSimulator in products. If you want to know about our development history, see History. 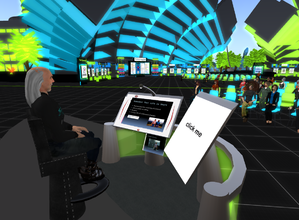 Participate via the mailing lists - opensim-users (for users) and opensim-dev (for developers). Contribute to this wiki, making the OpenSimulator documentation even better. Participate in one of the weekly Office Hours for OpenSimulator. We currently have weekly office hours for development, wiki work, and testing. Make sure to read through Contributions Policy before starting participation. It has the policy, guidelines, and licensing conditions for the OpenSimulator project.